The Hornstick is a new ergonomic device for all horn players which gives the player a more comfortable, effective and healthy way of playing this beautifull instrument. We pay much attention to how the tools and equipment we use everyday effects our health and comfort. This is the science of ergonomics. 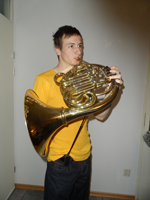 Because of its size and weight the horn does pose special ergonomic challenges, the more important ergonomic considerations become. 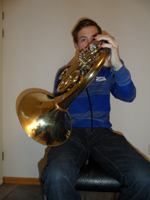 Using the Hornstick also improves the most important aspects of brass playing, breathing and air flow. The only task remaining for the left hand is to balance the horn and keep the mouthpiece in the right place and angle for each situation. . 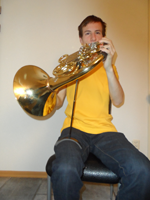 When using set A you can play the horn sitting, the horn is supported on the thigh. When using set B you can play the horn while you sit or stand. The current hornstick allows the player to support the horn and to move the horn in all positions. With the new hornstick you can also change the height from the stick while playing.